The bitter melon (also known as bitter gourd) looks like a cucumber but with ugly gourd-like bumps all over it. As the name implies, this vegetable is a melon that is bitter. 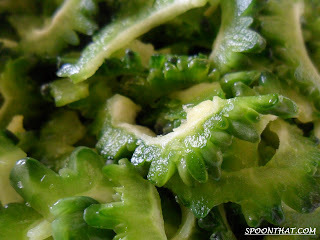 There are two varieties of this vegetable: One grows to about 20 cm long, is oblong and pale green in color. 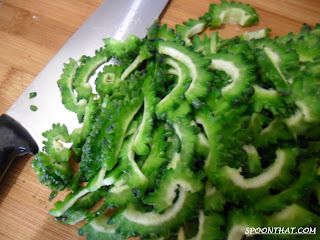 The other is the smaller variety, less than 10 cm long, oval and has a darker green color. Westerners may not be so used to bitter melons, so may find them more difficult to consume. But if you can generally take bitter taste, you may be able to take this too. Try it, at least for all its healthful virtues! Choose unripe bitter melons that are firm, like how you would a cucumber. Avoid those that have turned orange or have soft spots. Ripe bitter melons can be excessively bitter. Store bitter melons in the vegetable bin in the refrigerator which has the right temperature. It should keep for three to four days.